Titanium metal is a wonderful material which has the splendid characteristics such as light, strong, anti-rust and coloring of rainbow. We YAMAICHI hope to be a technology group which can contribute to the human life by utilizing the good unlimitedcharacteristics of Titanium. 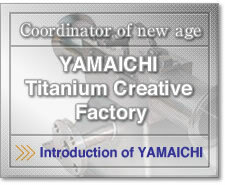 Introduction of Titanium Application & Development Company YAMAICHI. 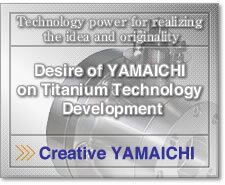 What is the desire of YAMAICHI on titanium Technology Development? 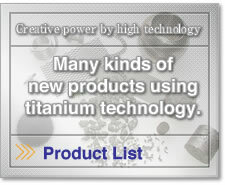 Look at the Many kinds of new products using titanium technology by YAMAICHI. Click here to "Product List"
YAMAICHI arranged the full range of machining equipment. What kind of metal Titanium is? We will answer to the question on Titanium. Copyright c Yamaichi Co.,Ltd. All rights reserved.